On Friday, Diamond Pet Foods expanded its recall to include another dog food product. 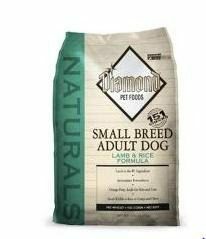 Added to the recall is the Diamond Naturals Small Breed Adult Dog Lamb & Rice Formula, which came in sample, 6lb and 18lb bags. The recalled lot was manufactured on Aug. 26, 2011. According to the company, the dog food was distributed in the following states, but may have been resold to distributers in other states as well: Colorado, Illinois, Kentucky, Louisiana, Michigan, Minnesota, Missouri, Oklahoma, Pennsylvania, South Dakota, Tennessee, Texas, and Wisconsin. We first reported on this recall back in April. At the time it was a small news item, a recall of a single product, and the company said no illnesses had been reported. Since that time, the recall has been expanded 8 times. More brands, types, and sizes of dog food have been added each time (Diamond Pet Food is keeping an updated list here). All the affected lots have been produced by the same plant, the Diamond Pet Food Processors of SC plant, in Gaston, SC. Last week, an FDA inspection report of the plant was released. The report noted a lack of microbiological analysis, multiple incidents of un-repaired or poorly repaired machinery which would make sanitation difficult, and a lack of sanitation/hand washing facilities in the production area. The report said that “all reasonable precautions” were not taken..
Salmonella is one of the most common causes of food poisoning in the US. According to the CDC, symptoms include diarrhea, fever, and abdominal cramps, and usually occur 12 to 72 hours after infection.